The fall flying season is here and we hope you will be joining us at McGregor Executive Airport for EAA Chapter 59's Fly-In Pancake Breakfast! On the first Saturday of the month, and for more than 10 years, EAA Chapter 59 has been giving pilots an excuse to go flying - pancakes! The November pancake breakfast will include a couple of new attractions as we introduce our newly formed IMC Club as well as the Discovery Aviation Flying Club. Come out to join us where you can learn more about these two great aviation programs in addition to the fun, fellowship, and great food. The location will be at the EAA Chapter 59 hangar. As you fly over, you will easily recognize the location by the vehicles and the hangar has EAA 59 painted on top. If you need directions to the hangar on the ground, we will try to have someone on 122.8 monitoring the UNICOM frequency. - Breakfast will be served from 8AM to 10AM. - For those wanting to participate in the IMC Club meeting, it will begin at 10:30 AM. So whether you arrive by airplane, helicopter, ultralight, hot air balloon (yes - that has happened in the past too), or car you are invited to join us! Come on out! 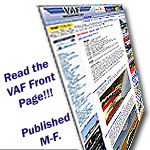 This would make a good addition to the VAF Calendar...see the link in the banner above. I am based in Bastrop tx (3T5) would love to visit.....still on? Absolutely! We will begin serving right around 8AM.